Shatrughan Sinha congratulated Nitish Kumar and Lalu Yadav when their alliance defeated the BJP in assembly elections in Bihar two years ago. 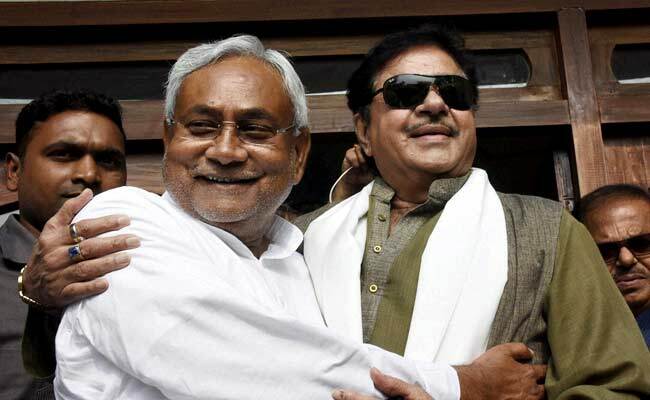 BJP MP Shatrughan Sinha has made no effort to mask his admiration for Bihar Chief Minister Nitish Kumar. Shatrughan Sinha, called Shotgun by fans and critics, fired seven tweets in a row today aimed at the BJP's most senior leader in Bihar Sushil Modi, after the latter sought that the actor-turned-politician be sacked from the party. Mr Modi had used two tweets to attack Mr Sinha for defending rival politicians Lalu Yadav and Arvind Kejriwal. "Its not necessary that the most famous people are the most trustworthy. The sooner "traitors" are thrown out of the party the better," Sushil Modi tweeted today. He also punned on the word "shatru" or enemy when he said, "The Lalu who even Nitish Kumar did not defend is backed by the BJP's 'Shatru.'" Shatrughan Sinha, who is a BJP member of Parliament, had this morning called for an end to "negative politics and mudslinging by opponents on our political leaders, be it Kejriwal, Lalu (Prasad) Yadav or Sushil Modi." He did not name Sushil Modi as he advised him to "substantiate your claims..or pack up! Can't just keep feeding media with one night stories & sensationalising. Enough is enough!" Sushil Modi has spearheaded his party's attack on Lalu Yadav, alleging the veteran Bihar politician and RJD chief's involvement in corrupt land deals worth 1,000 crores. Mr Modi shares icy vibes with Mr Sinha, who has been sidelined for months and has seemed for all that time to be on the verge of being thrown out of the BJP owing to his controversial comments on social media, often attacking his own party. He has also made no effort to mask his admiration for Bihar Chief Minister Nitish Kumar and had prominently congratulated him and his partner Lalu Yadav when their alliance soundly defeated the BJP in assembly elections in Bihar two years ago. Today, he had fulsome praise for another bitter BJP critic, Delhi Chief Minister Arvind Kejriwal of the Aam Aadmi Party, who has been accused by a former minister of corruption. "Individually I hold all political leaders, especially Kejriwal, in high esteem for their credibility, struggle and commitment towards society," Mr Sinha tweeted. Hours later, his tweets took on Sushil Modi, who he blamed for the BJP's loss in the Bihar assembly elections.